and the only Republican Journal in Washington Co., Md. Its daily edition contains all the latest news of the world, full accounts of all the local happenings in the county and accurrate reports of Baltimore and Hagerstown provision, crop and cattle markets. 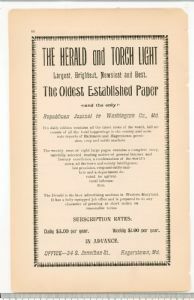 The weekly issue of eight large pages contains a complete story, carefully selected reading matter of general interest and literary excellence, a condensation of the world's news, all the town and county intelligence, late provision, crop and cattle markets and a department devoted to agricultural information. The Herald is the best advertising medium in Western Maryland. It has a fully equipped job office and is prepared to do any character of printing at short notice on reasonable terms. OFFICE 34 S. Jonathan St., Hagerstown, Md.